An upright stem with hairy and rough texture leaves. 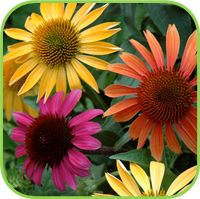 The flowers is head-cone-shaped and is found in a variety of colors, dark purple, pale pink, yellow and white. Perennial. H: 80cm W: spread 50cm. 12cm, 17cm. 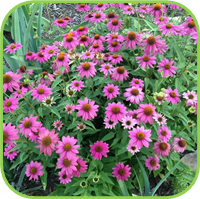 • The pink coneflowers give a colourful display in the garden from midsummer to early autumn and are excellent for cutting. 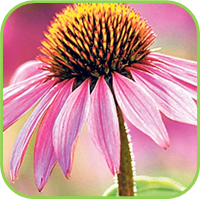 • Attracting Beneficial insects: Butterflies, cone provides a sturdy perch. • Birds: will enjoy the seed if left to mature. • Use an infusion in the bath to heal and sooth the skin. • Assists in recovery from chemotherapy. • Chronic fatigue syndrome, Septicaemia, Chronic infections, Herpes infection. • Conditions of imbalanced immunity like allergies. • Contains flavonoids which strengthen blood vessels and destroy free radicals. • Recurrent candidiasis due to weakened immunity. • A cleansing lotion for sexually transmitted infections. • Infusion taken three times per day. • Acute condition: 5ml every 2 hours until symptoms improve, then 3 times per day until no symptoms.